Ryan Vig, long time customer was the volume buyer of the day. 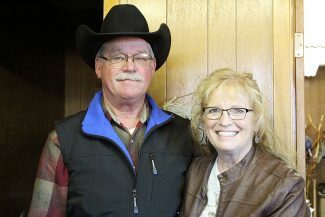 Jodi and JoAnn Brown bought two high selling bulls. 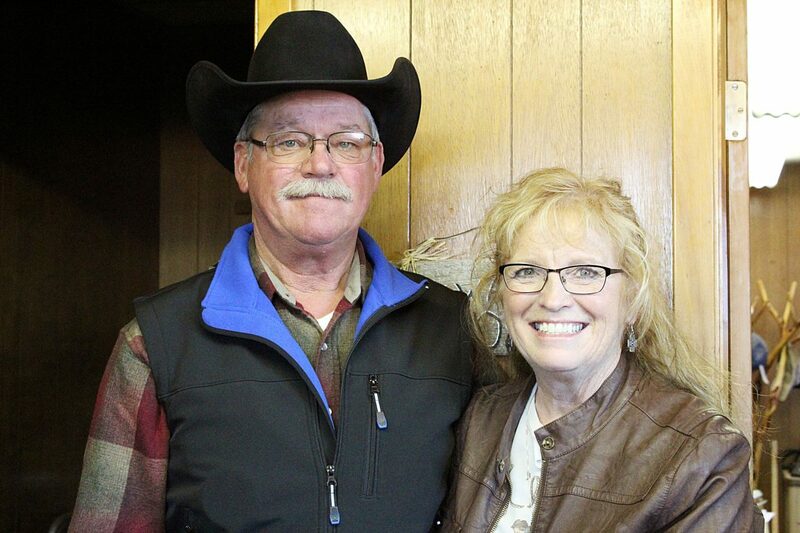 Pat and Barb Clark bought bulls at the first Wedge Tent sale and are still buying. 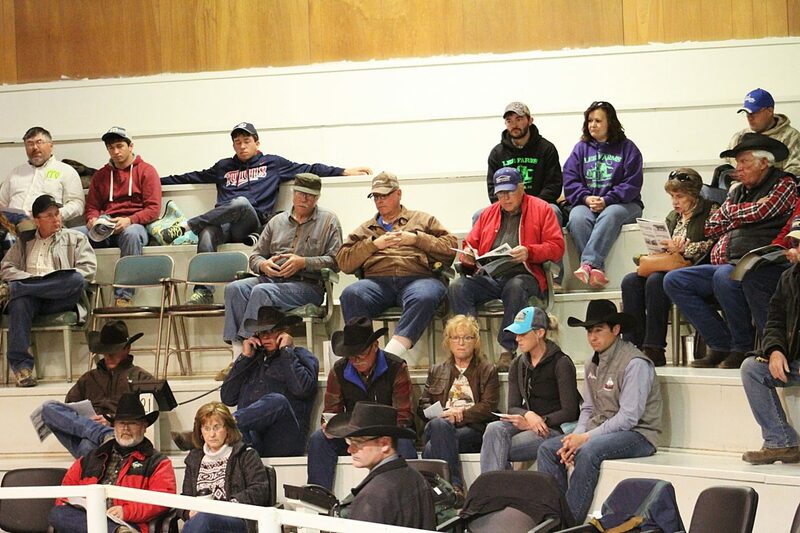 A good crowd was on hand for the Carmichael Wedge Tent sale. Lot 550, WT Pine Edition 883C-550, was sold to Jody Brown of Faith, SD for $6,500. He's a Pinebank Waigroup 41/97 son that was born 4/13/15 at 75lbs and was 588lbs at weaning. His EPDs include BW 1.9, WW 32, YW 50, and Milk 21. Jody Brown of Faith, SD struck again on Lot 601, WT Creek 925C-601, for $6,000. 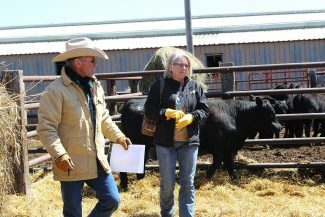 This is a WT Beaver Creek 118 son born 4/6/16 at 80lbs and was 614lbs at weaning. $5,750 was the high bid on Lot 541, WT Creek 369C-541, for Ryan Vig of Faith, SD. WT Beaver Creek 118 is the sire and this bull's EPDs are BW 0.3, WW 36, YW 51, and Milk 17. He was born 4/15/17 at 75lbs and was 699lbs at weaning. 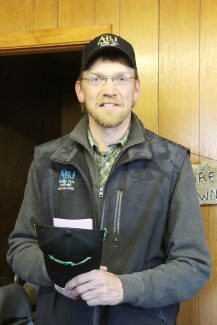 Roger Gaugler of Almont, ND bought Lot 607, WT Creek 365D-607, for $5,500. He's another WT Beaver Creek 118 son that was born 3/29/16 at 74lbs and was 565lbs at weaning. His EPDs include BW -0.2, WW 25, YW 31, and Milk 15. Ryan Vig wasn't done yet either buying Lot 543, WT Creek 371C-543, for $5,250. He's a son of…you guessed it, WT Beaver Creek 118. This bull was born 4/15/17 at 75lbs and was 609lbs at weaning. Lot 548, WT Hunter 353C-548, is headed to Gettysburg, SD with Dan Parker for $5,250. He is sired by PCC Colorado Hunter 1062P and scored EPDs of BW -1.7, WW 17, YW 35, and Milk 16. He was born 4/22/16 at 81lbs and was 636lbs at weaning.